Set on the banks of the river Tay and inspired by the cliffs to the east the new V&A Dundee stands at the centre of the £1bn transformation of the Dundee waterfront, once part of the city’s docklands, and is set to be a magnet for creatives and tourists when it opens in eight months. Designed by Japanese architect Kengo Kuma, V&A Dundee will feature permanent displays, temporary exhibitions and new commissions all linked through a strong learning programme. At its heart will be the permanent Scottish Design Galleries telling the story of Scotland’s design heritage through 300 objects across a range of disciplines from the V&A collections. The museum’s Michelin Design Gallery will open with the Scottish Design Relay, presenting design prototypes created by young people in communities across Scotland from Orkney to Govan. The museum will also offer an international programme of changing exhibitions showcasing what it says will be the very best of design from around the world and new design commissions including work by Turner Prize-nominated artist Ciara Phillips. The opening exhibition Ocean Liners: Speed & Style, has been created by the V&A and the Peabody Essex Museum in Salem, Massachusetts, who say it is the first to explore the design and cultural impact of the ocean liner on an international scale. 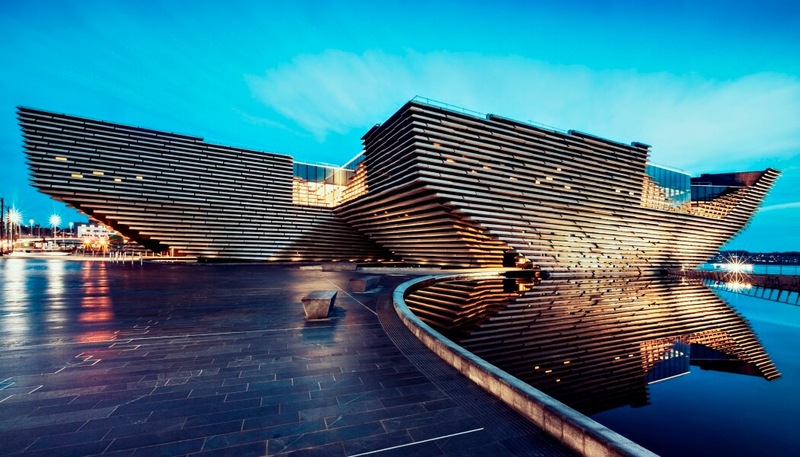 It will open at the V&A in a fortnight before travelling to Dundee. One of the stand out exhibits of the museum, located at the centre of the Scottish Design Galleries, will be Charles Rennie Mackintosh’s Oak Room, fully restored and preserved in partnership with Glasgow Life. The 13.5-metre-long panelled room was originally designed for Miss Cranston’s Ingram Street tearooms in Glasgow in 1907, before being saved – and placed in storage in hundreds of pieces – almost 50 years ago. As the only V&A museum in the world outside London the museum hopes to be an international centre for design and a place of inspiration, discovery and learning. The new museum enables major V&A exhibitions to be seen more widely by more people across the UK and Tristram Hunt, Director of the V&A, said the opening of V&A Dundee will be a remarkable moment for Dundee, the V&A and the UK. The museum will also include dynamic learning spaces to accommodate visitors of all ages and backgrounds to learn from and participate in design creativity; a design residency studio where designers will share work-in-progress with visitors; a multi-purpose auditorium for conferences, design jams and community events, and a restaurant with spectacular views from its open terrace over RRS Discovery and the River Tay. V&A Dundee is being delivered by an innovative founding partnership of the V&A, Dundee City Council, the University of Dundee, Abertay University and Scottish Enterprise.